This lively presentation will give you tools that will inspire your team to go the extra mile for your customers and produce more for your organization. 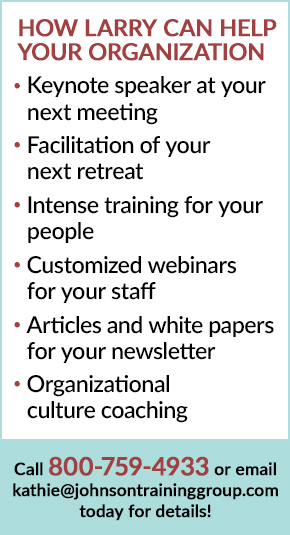 You’ll learn how to raise your team’s productivity, increase customer satisfaction, reduce staff turn-over, and enhance employee morale. The program is based on solid research that shows what you can actually do to make a significant, positive impact on the performance of your team. Plus: You’ll get a comprehensive handout in pdf form that will be e-mailed to you prior to the program. BONUS: You will get your specific questions addressed in a live Q&A immediately following the presentation. Convenient Learning: Enjoy the convenience of learning from your office or home. All you’ll need is a computer with speakers or a telephone. Best of all, your fee includes everyone in your office or location who can listen and monitor the slides on a computer. What People Have Said About Larry Johnson and his How To Be A Great Boss:“Very practical and concise – lots of fun.” Tom Donovan, VP of Distribution, Koch International, Port Washington, NY. “Excellent speaker, great content. Simple conversation, simple advice, simple rules.” Theresa MacPhee, Customer Ser vice Manager, MTT, Halifax, NS. “Larry was passionate and involved in the presentation. BEST SESSION SO FAR AT THIS CONFERENCE” Ruth Gins berg, President, California Closets. “Great presenter! Excellent use of humor & story to make presentation come alive. Thank you.” Kim Kelley, Customer Service Manager, Avista Advantage, Spokane, WA. “It was great to hear from other about ways they reward and motivate others. It was also good to learn about the INTAN GIBLES!” Deborah Pollock, System Analyst, Texas Comptroller, Austin, TX. “Larry is very inspirational. Great humor!” Ruth Clark, Director of the Call Center, Bodek & Rhodes, Philidelphia, PA.
“I appreciate the real-world examples and the audience interaction – an excellent speaker – motivational and engaging. Thank you for allowing us to share ideas.” Mary L. Clement, Sr. Program Manager, Nortel Networks, RTP, NC. “Great energy for an end-of-day session. I liked the interaction with the group. Took back motivational ideas and DO’S AND DON’TS.” Loralee Stickel, Mgr. of Business Development, Interactive Data.